Many dream to equip a comfortable and stylish sauna for personal use or for a small business. Our company is engaged in making baths from cedar for individual projects. We use only environmentally friendly wood for buildings with maximum thermal insulation. We develop original designs with an extraordinary design on a turn-key basis. On the website of our company you can see prices for bathhouse projects from cedar. The cost depends, first of all, on the quality of wood and the speed of construction. Cedar logs have always been valued highly, because felling of trees is allowed only in certain areas of the forest. If you do not spare the resources and build a steam room of this material, you can enjoy the special aroma and pleasant wood texture all year round. Ideal for steam room in Finnish and Russian style. The cedar bath has many advantages, such as the prestige of the tree, beauty and unique energy, high thermal insulation of large diameter logs, etc. The only thing that can complicate the project is the price of a cedar bath under the key. After all, it is always higher than for buildings made of pine and larch logs. We are ready to create new architectural solutions that are complex from the technological side. We are not afraid of the complexity of the work, which requires high skill of the performers. 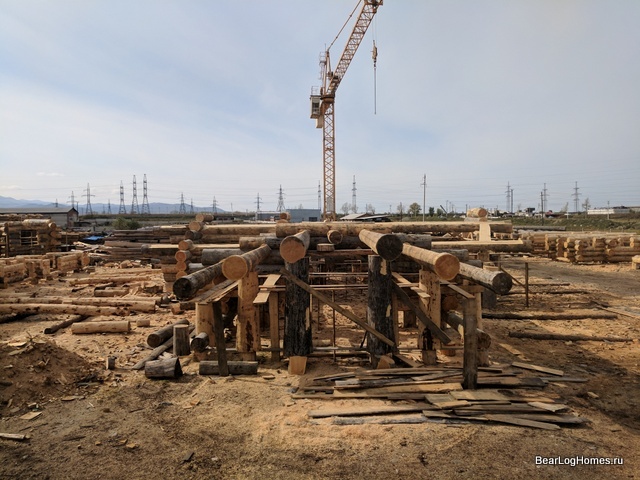 Terms of cooperation with the company "Bear Log"
If you want to build an environmentally friendly sauna that will protect and strengthen your health for decades, please contact Medvezhy Log company - good houses from cedar. A team of true masters of their craft who are not afraid of hard work will realize your dream of construction of a bathhouse for manual cutting. we proceed to the final part of the work - the shrinkage of the frame. After laying the roof, laying out engineering systems and finishing the house. The bathhouse is ready for delivery to the client! Call + 7 902 9966727. We will respond promptly to all questions at any time. Or order project of a cedar bath on an individual project.